Postcard US-1830375 to Taiwan shows a variety of roses in the International Rose Test Garden in Portland, Oregon which I visited on September 29, 2010 during my JetBlue AYCJ trip. There are over 7,000 rose plants of approximately 550 varieties in this 18,200 square meter or 4.5 acre garden, where you can see downtown Portland and Mount Hood in a distance.It was mostly cloudy with light rains in the morning I visited so I couldn't see Mount Hood. Nonetheless, the view of roses was not disappointing even it was near the end of their April through October blossom season. The garden was established in 1917 to serve as a safe haven for hybrid roses grown in Europe during World War I. 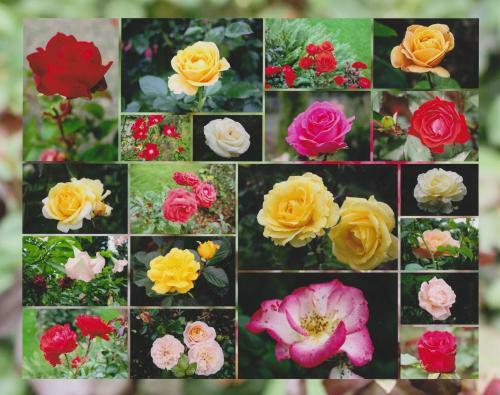 Today new roses are continually sent to the garden from around the world for testing of their colors, fragrance, disease resistance and other attributes. It is the oldest continuously operating public rose test garden in the United States. It exemplifies Portland's nickname of the "City of Roses" and the volunteering efforts from Portland citizens who contribute about 500 hours every year in tending the garden. It was also listed in the Ten Things to Do in Portland by the Time magazine.